Why CAN I Get Better? According to Dr. Horowitz …"This is a very comprehensive overview of Lyme and Tick Borne disorders with a map which can be applied to all chronic diseases. Nothing has ever been done in this scope and breadth. It should really help patients and doctors have a deeper understanding of the disease and how to get patients better. " He writes M.D. stands for "Medical Detective," and it has been this unrelentlng desire to uncover the hidden cause of disease which has helped him succeed. Now Dr. Horowitz has the listening ear and attention of chronic sufferers and health care practitioners around the world. I have been a Lyme sufferer. I have written about my experiences before but I also see patients everyday who have fallen between the cracks, been misdiagnosed, undiagnosed or whose prior treatments have provided little relief or even worse have left them penniless and without answers. Did you notice the name of this post? “Why CAN I Get Better?” Sometimes a small shift in perception can open an entire new landscape of possibility and potential than we had accessed even a a second ago. Let me use one of Dr. Klinghardt’s favorite allegories to explain. A friend wrote, "If this is true – and, who am I kidding? of course it is – I worry that we all stagger around, destined to be misunderstood. Or, worse. We’re all methodically, apocalyptically misunderstood, and it’s too dark to notice." Biochemistry but not Quantum Physics. Dr. Horowitz expanded this model by devoting an entire chapter to Meditation and Mind Training as well as providing a 16 point check list that includes: Immune dysfunction, Inflammation, Environmental toxins, Functional medicine abnormalities with nutritional deficiencies, Mitochondrial dysfunction, Endocrine abnormalities, Neurodegenerative disorders, Neuropsychiatric disorders, Sleep disorders, Autonomic Nervous System Dysfunction and Allergies. Kudos to Dr. Horowitz. Yet, even Dr. Horowitz is only looking for the keys where the light has been turned on. Let me introduce you to a perspective of health and healing where the light is still quite dim yet amazingly bright for those who are willing to see it? Are you the type that "believes" only after you have seen it or are you the type that knows sometimes you have to “Believe” before you see it. 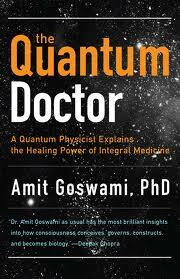 Quantum physics is a branch of science that deals with discrete, indivisible units of energy called quanta. With the discovery of Quantum physics, our understanding of the world has changed considerably. Prior to its discovery, it was thought that matter was solid and rigid. Quantum Physics has shown us that all matter is made of the same materials and it is the vibration, tone and coherence of these particles that gives matter all of its properties. This includes you and me. Today’s scientists not only view the body as a physical structure, but also as an energetic system. This understanding is revolutionizing the health care system and our ability to heal and be well. While at a glance this may seem like just another strange theory, it contains many clues as to the fundamental nature of the universe and may be more important then even relativity in the grand scheme of things. Furthermore, it describes the nature of the universe as being much different then the world we see. As Niels Bohr said, "Anyone who is not shocked by quantum theory has not understood it." Dietrich Klinghardt, M.D. Ph.d has a unique perspective on health and how we heal because he is trained and practices in both Germany and the United States. He remarked that his German patients don’t want “more tests” and “drugs” they want more energy based solutions and frequency based medicine. His U.S. patients demand a diagnosis and treatment based on their Biochemistry and Biology. It’s time to shine the light on the wholeness of humanity not only as it relates to humankind but to Everykind. The animals, the plants, elements, solar system and multi-verse. After all don’t we say as above so below? We live in a multi-verse not a Universe–our body comprises multiple systems not just one. We have a spleen and a liver but we also have consciousness and a Bio-field. 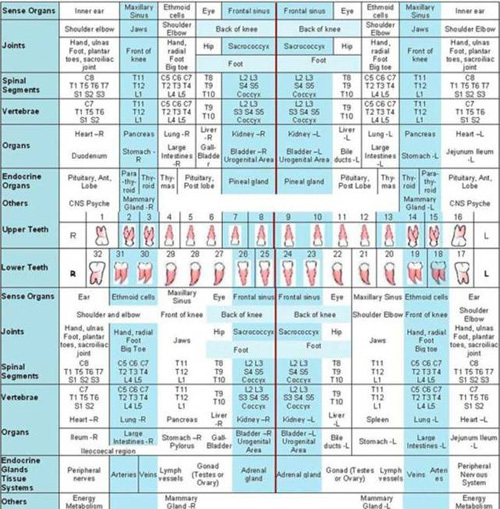 Take a look at this chart which shows an example of how a few systems are inter-related. . As a Chiropractor, if I find a patient who continually presents with a subluxation at T9/T10, I will also check Liver/Gall Bladder function as well as any dental contribution at Tooth #6. Using ARTesting we can determine if the tooth is contributing to the subluxation /Gall Bladder dysfunction or the other way around. Patients in our office are assessed using both models. We apply the science of logic, reasoning, lab reports, diagnostics and technology but we also value intuition, spiritual concepts, quantum physics and the frequency of love which is nature’s inherent healer. Geneticists report that 25% of our genes are hard wired. 75% are not. Epigenetically speaking then, diseases of civilization spring mostly from inner and external environmental "obstacles to cure" matrices - colds to cancers – mycoplasmas to miasms- prions to parasites- Lyme to ley lines – ground matrix to geopathic stress - hormones to hormesis etc. How does a health practitioner begin to unwind the complexities and layers for the patient entrusted in their care? If one is only skilled in MTHFR–then everything will look like it’s an MTHFR issues, if one is only skilled in Adrenal Health…then everything will look like an Adrenal issue. If one is only skilled in Gastrointestinal dysfunction then everything will look like a Gut issues. Get the point? At raSa health we are skilled in using Autonomic Response Testing which applies the principles of Quantum Physics and has proven to be the most accurate form of muscle testing used to determine what an individual needs at any point in time in order to restore balance to the system. In the hands of a skilled practitioner, ARTesting can determine where, how and why the Autonomic Nervous System is BLOCKED and what it will take to return it to proper flow. We also use it to determine the proper nutrients the body needs and prioritize the underlying issues that are stressing the body. Health and healing is never a “one size fits all” approach. For one patient, the choice of chemotherapy and surgery may be the best choice. For another that may not be an option. If you are seeking a model that embraces the whole system and not only the parts, you may find the answers you seek at raSa health. A branch of medicine that recognizes this is known as Anthroposophical medicine. Anthroposophic Medicine (Anthropos=human being: Sophia=Wisdom. Health is a result of a harmonious relationship between all systems. This is partnered health care. It is not the result of someone with a white coat writing a prescription. It is the result of partnering with a practitioner that beholds the truth of your being even when you do not know it for yourself. This model requires communication, commitment, inner work, discipline and a willingness to experience joy, divinity and health. Why CAN I Get Better? Because we come with a divine blueprint that recognizes we are more than our biochemistry. Until we shine the light on the intrinisic principles of our very nature we will continue to chase the bugs, destroy our environment and pollute our own bodies. Why CAN I Get Better? because you are better. Embrace the fullness of your divine blueprint and you will soar to a new level of health you may have never been told is possible. I can tell you it is. I see it everyday in different ways. If it happens for others, it can happen for you. If you have found yourself reading this and saying, yes, yes, that makes some sense to me. Come on in and let’s shine the light on all the underlying issues that may be contributing to the process. What I love most about this work? The testing is so sensitive we detect imbalances BEFORE they become pathology. We don’t wait for the car engine to fail before we bring it in for service….Doesn’t your body deserve the same care? This entry was posted in blog and tagged 5 Levels of Health & Healing, Autonomic Response Testing, Chiropractor, Dietrich Klinghardt, Functional Medicine, Klinghardt, Lyme Disease, MCIDS, Mold, PEMF, Quantum Health, raindrop therapy, toxins, Why Can't I get Better. Bookmark the permalink.